Memorial Day is coming up. I am not very good at correlating holidays with our school work, but this time I’m going to try. 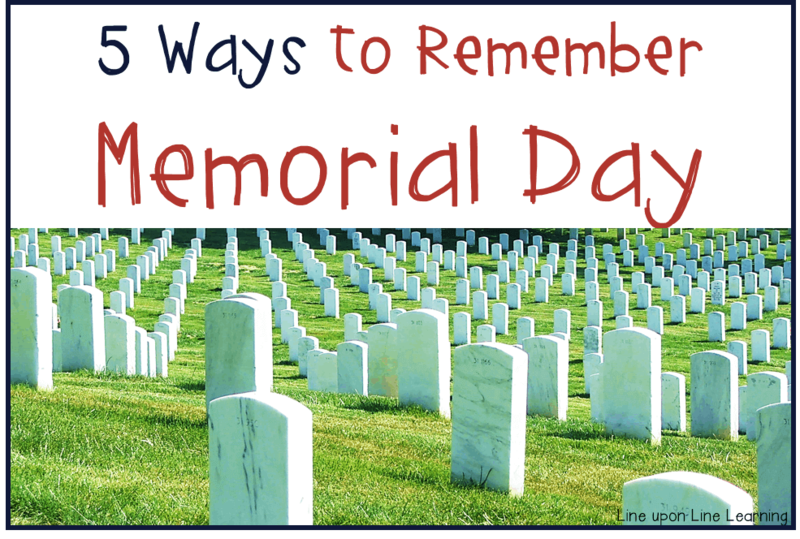 Here are some ways we’ll remember Memorial Day this year. 1. Learn about the history of Memorial Day. Why do we have this holiday? It is to remember those who have given their lives in the service of the country. 2. Learn about the American Flag. While my son knows what the stars and stripes represent, does he know how to properly care for the flag and fold it? 3. Talk to a Veteran or Member of the Armed Services. While Memorial Day is about memorializing those who have passed on, I believe it is also important to remember those who fought and lived. Both of my grandparents served in World War II, and both of my son’s grandparents served during Vietnam as well. My grandpa never spoke of the horrors he faced will in the Navy on the Pacific, but I am so grateful for his service. My children need to learn of that service too. My grandpa is no longer alive, but my son’s grandparents are. His uncle is a reservist. There are plenty to talk to and thank! 4. Learn about the Constitution. I think this is such an important concept. Many Americans take the freedoms we enjoy for granted. I want to make sure my children know why we have the freedoms we do! 5. Celebrate freedom with a barbecue, parade, or family get-together. This is what people do anyway. But I believe it is important to remember the joy that comes from having the country we have. What a great day to rejoice and celebrate those who have given their time and their lives for our country. How will you teach your young ones about Memorial Day this year? Wonderful lesson plan, glad I stopped by from List it Tuesday.